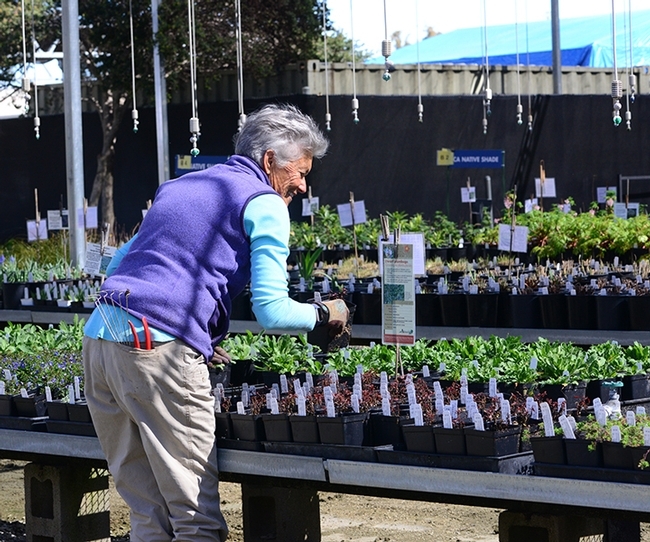 Oh, the Plants You'll See at the UC Davis Arboretum Plant Sale! 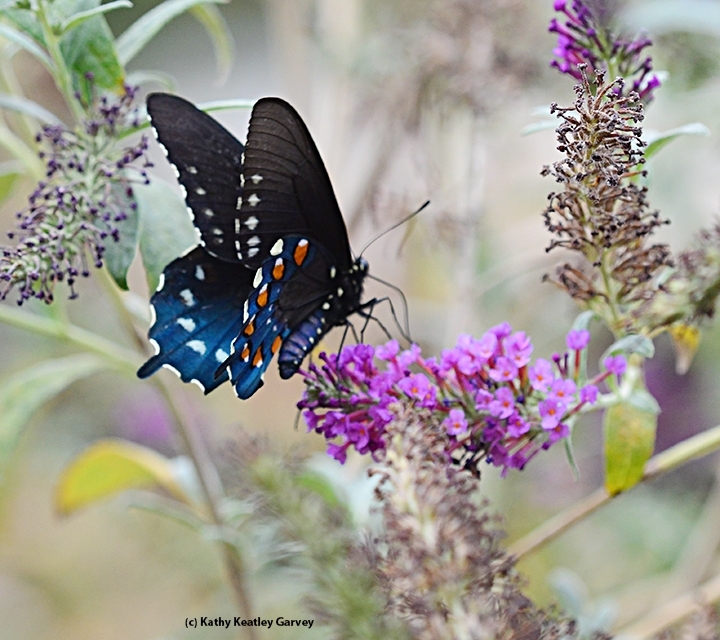 Who doesn't love that "bolt of blue," the pipevine swallowtail, Battus philenor? 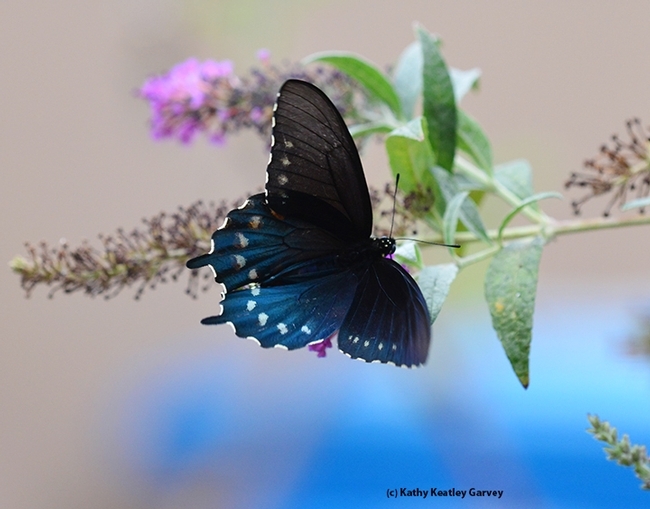 A black butterfly with iridescent blue hindwings, it's a frequent visitor to our garden, where it nectars on such plants as the butterfly bush, Buddleia davidii, the Mexican sunflower (Tithonia), and sage (Salvia). But if you want it as a permanent resident, plant its host plant, the California Dutchman's pipe, Aristolochia californica. 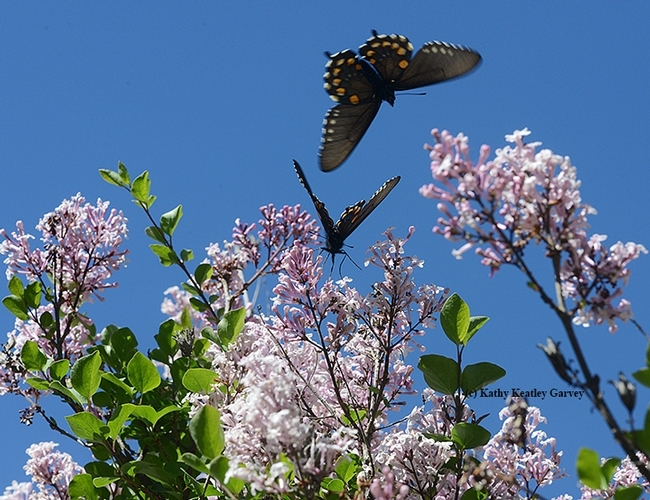 You'll see the cycle of life--from eggs to caterpillars to chrysalids to adults. And that breathtaking "bolt of blue." The Dutchman's pipe is just one of thousands of plants that will be offered at the UC Davis Arboretum and Public Garden's Plant Sale on Saturday, March 9 at its nursery on Garrod Drive, near the UC Davis School of Veterinary Medicine. 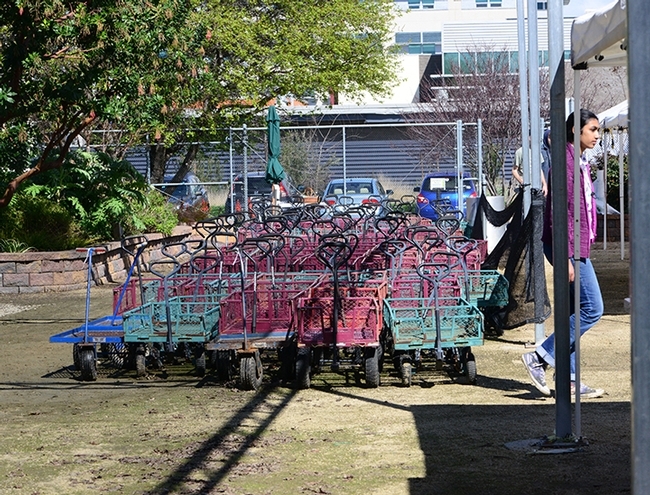 Members can shop from 9 to 11 (you can join at the gate or online) and the public sale is from 11 a.m. to 1 p.m.
As they say online: "Members of the Friends of the UC Davis Arboretum and Public Garden or the Davis Botanical Society are welcome to shop our first spring plant sale and receive early admittance for the best plant selection, a $10-off member appreciation gift, complimentary refreshments and 10% off their plant sale purchases! In addition, new members receive a $10-off coupon as a thank you for joining. Not a member? Join the Friends online, at the door or call ahead. 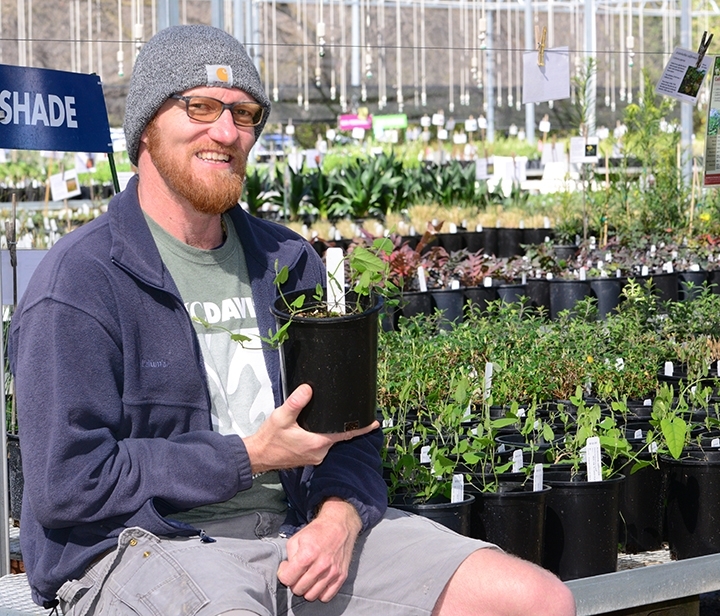 Most of the plants are grown onsite, says Taylor Lewis, nursery manager. 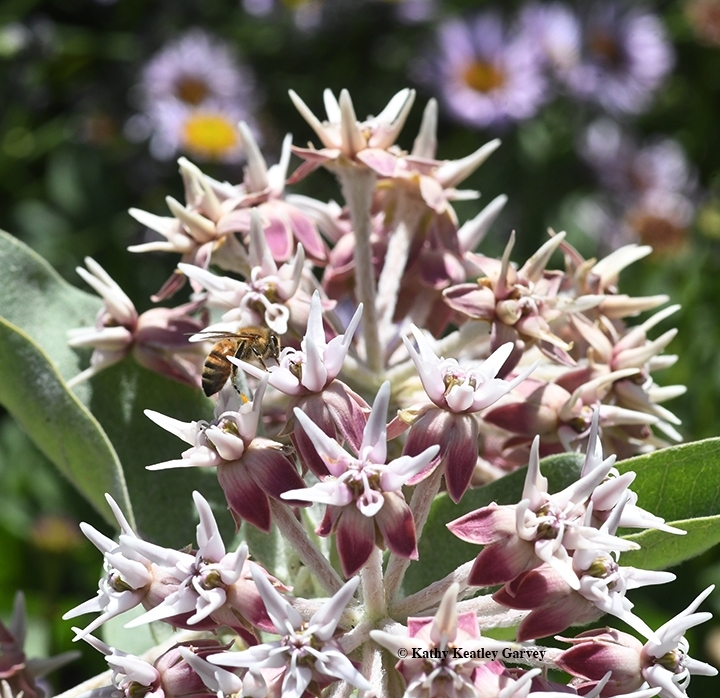 Native plants, drought-tolerant plants, host plants for butterflies, and plants that attract bees, butterflies, hummingbirds and other pollinators are popular, not to mention the much-in-demand Arboretum All Stars, plants that do well in our area, even if you don't have a green thumb. Want to know what plants are available? The website provides a list in both PDF and Excel. If you peruse the list--and you should before you go--you'll find narrow-leaf milkweed and showy milkweed (host plants for monarchs), and plants with such fascinating names as Bush Tango Kangaroo Paw, Aster Bugtopia, Dazzleberry Stonecrop, Bee's Bliss Purple Sage, Pocahontas Beard Tongue, Red Dragon Monkey Flower, and Baja California Fairy Duster. And lots of lavenders and salvia! 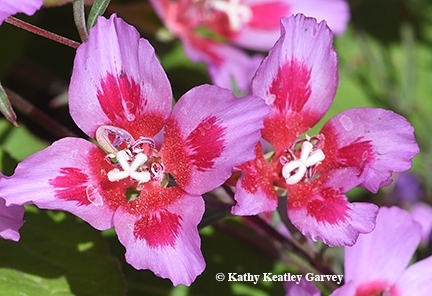 California figures into many of the names, from Calistoga California fuchsia, California Dutchman's pipe, California buckeye, California lilac and California sagebrush. Are you ready for National Pollinator Week, June 18-June 24? 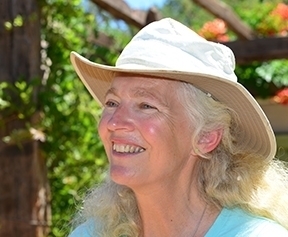 A spectacular pollinator garden that's a "must-see" is Kate Frey's pollinator garden at Sonoma Cornerstone. Kate Frey, a world-class pollinator garden designer, pollinator advocate and author who addressed the UC Davis Bee Symposium in March on "Designing Bee Friendly Gardens," has created a masterpiece. And yes, the pollinator garden is open to the public--no admission fee. We visited the garden last Saturday and saw a pipevine swallowtail nectaring on Nepeta tuberosa, yellow-faced bumble bees sipping nectar from Stachys bullata, hummingbirds scoring nectar from salvia, and honey bees foraging on everything from Scabiosa "Fama Blue" to a native milkweed, Asclepias speciosa. This is a happy place. 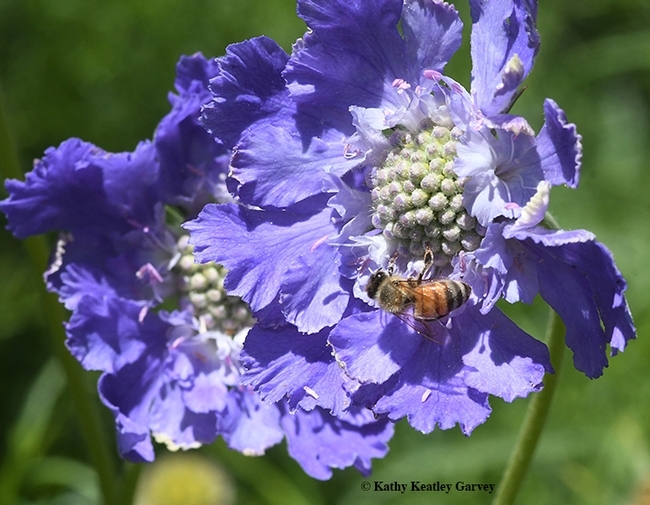 As she told the crowd at the Bee Symposium, hosted by the UC Davis Honey and Pollination Center and the UC Davis Department of Entomology and Nematology: Whether you plant them, nurture them, or walk through them, bee gardens make us happy. 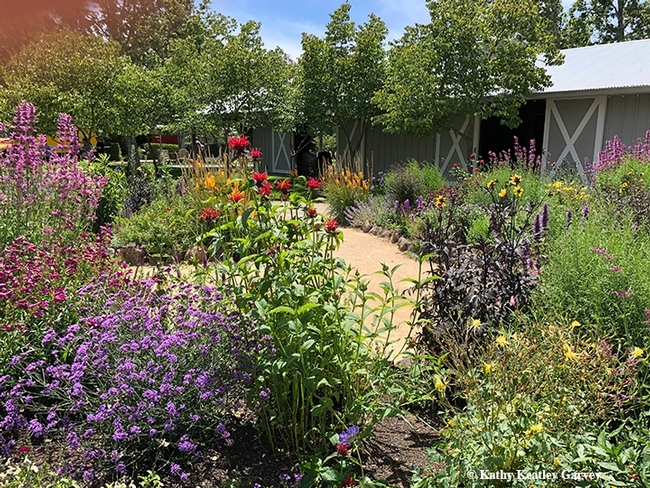 Frey's sign at the Sonoma pollinator garden explains that "All the plants offer food resources of pollen and nectar for pollinators such as native bees, honey bees, hummingbirds and beneficial insects. Pollen is a protein, mineral and fat source and is primarily a larval food for bees, while nectar is composed of various sugars and is the main food for pollinators and the adult life stage of many beneficial insects. 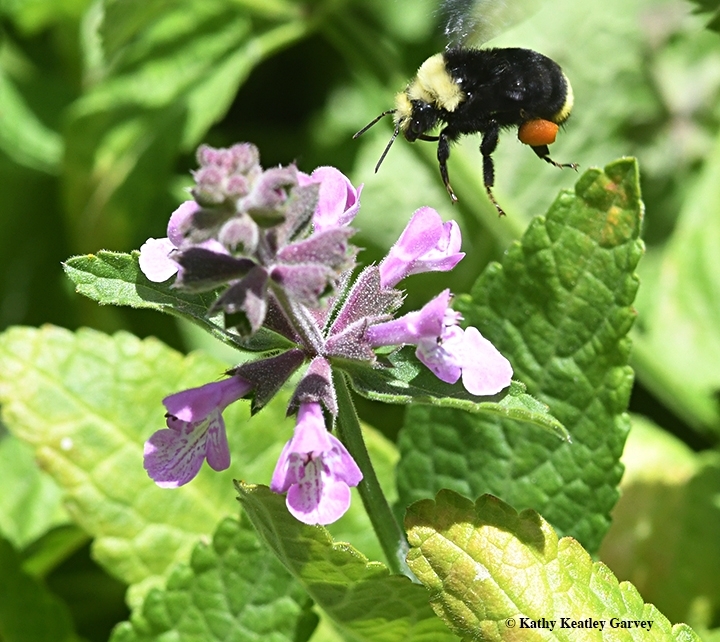 Pollinators need a continuous food source for many months of the year. This garden contains a range of plants that will bloom in succession from early spring to late fall." Frey's sign also noted that "Pollinators all have preferred plants they feed from, and flowers cater to specific pollinators. Some flower shapes are designed to exclude unwanted pollinators. The long, constricted floral tubes of honeysuckles or many salvia exhibit their focus on hummingbirds as primary pollinators. Other flowers nectar, like coffee berry is easily accessible to all pollinators. This garden contains a wide range of plants to appear to a variety of pollinators. 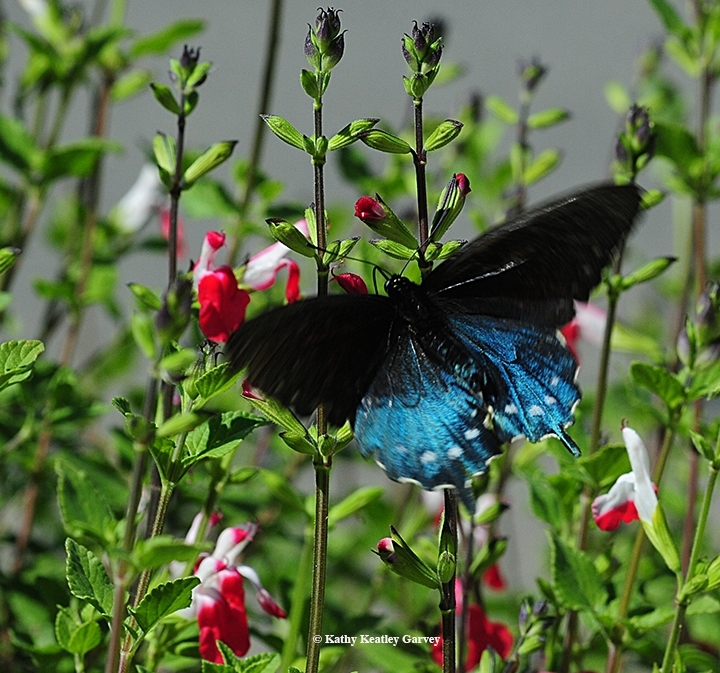 Over 80 percent of flowering plants require insect or animal pollination. What insects or birds do you see visiting each flower type?" "The same plants that support pollinators," Frey indicated on the sign, "also make us happy." Today was a glorious day in the Ruth Risdon Storer Garden in the UC Davis Arboretum. 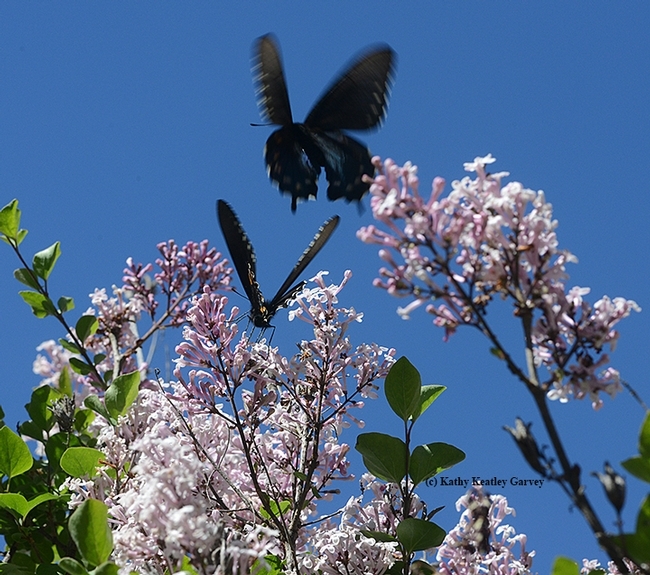 The scent of the Korean lilac, Syringa patula, drew several pipevine swallowtails (Battus philenor), their iridescent blue hind wings gleaming in the late morning sun. Butterfly guru Art Shapiro, distinguished professor of evolution and ecology at UC Davis, calls the pipevine swallowtail "the signature riparian butterfly of our region, occurring along streams in foothill canyons and on the Central Valley floor, essentially everywhere where its only host plant, California Pipevine or Dutchman's Pipe, Aristolochia californica, occurs." "This species is warningly colored and inedible to vertebrate predators," Shapiro writes on his website. "It derives its protection from the toxic aristolochic acids produced by the host, which it sequesters; females even pass these along to the eggs, which are also protected (and are brick red, laid in bunches of up to 20, and quite conspicuous)." 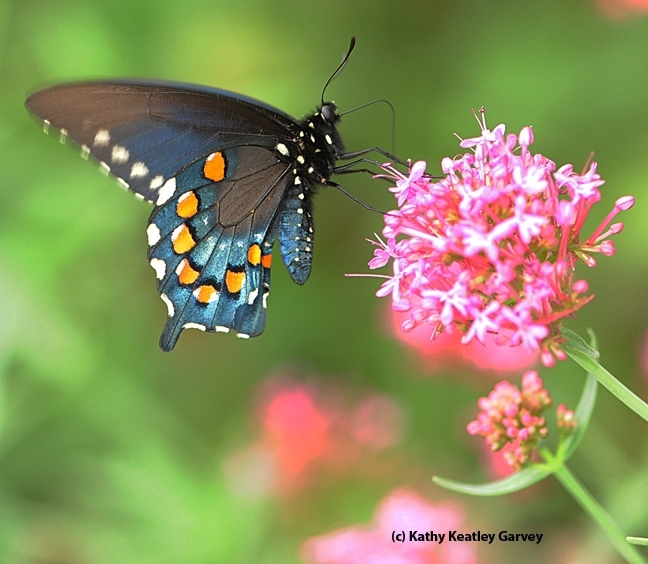 Shapiro notes that the pipevine swallowtail flies from late winter (February-March), to autumn (October, occasionally November) but is "much more numerous before the 4th of July than later." The Korean lilac provides a great nectar source for the butterflies. This one in the Storer Garden is a good 10 feet all. 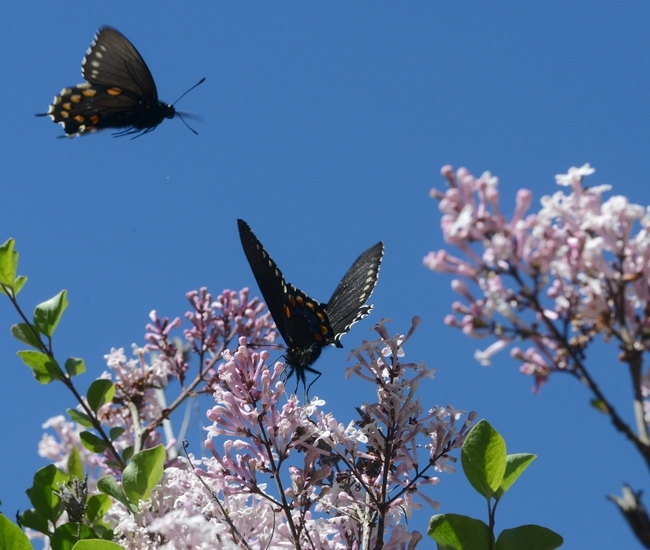 Native to China and Korean, it's also known as "The Miss Kim Lilac," discovered by Elwyn Meador and reportedly named for his Korean assistant. So today, the iridescent blue wings and the featherly purple blossoms collided in the air in the Storer Garden, with promises of more butterflies and blossoms to come. Meanwhile, the UC Davis Arboretum officials are gearing up for their first public plant sale of the spring season. set Saturday, April 2 from 9 a.m. to 1 p.m. at the UC Davis Arboretum Teaching Nursery on Garrod Drive, right next to the Storer Garden. Check out the website for the list of plants available. Never say "pipe down" to a pipevine swallowtail. It's a butterfly we treasure. 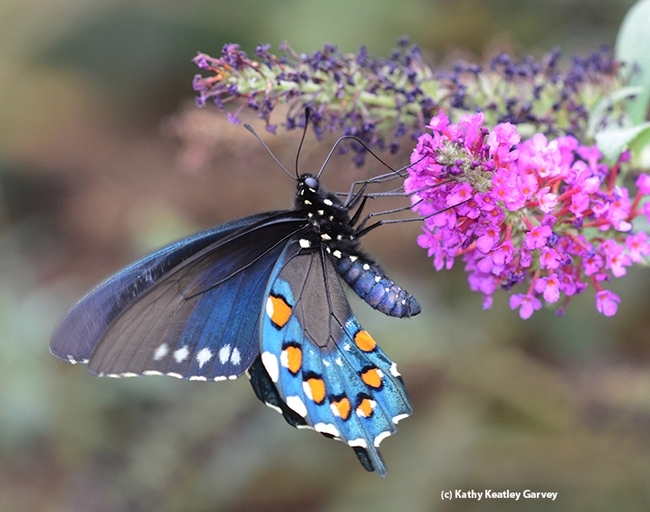 You may have seen it nectaring on your butterfly bush. It's black with blue iridescent upper wings and orange arrowhead-like spots on its inner wings. 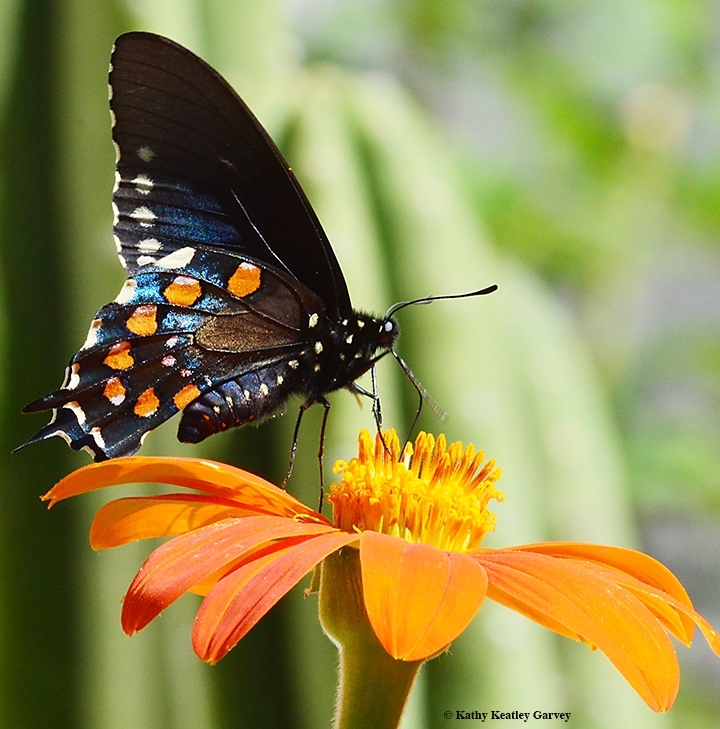 Butterfly expert Art Shapiro, distinguished professor of evolution and ecology at the University of California, Davis, says on his website, Art's Butterfly World, that Battus philenor is "unmistakable and very conspicuous as both a larva and an adult." So are the eggs. 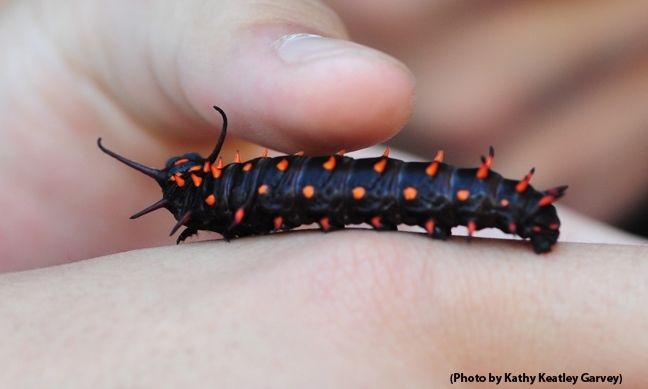 The eggs are red or rust-colored, while the larvae or caterpillars are black with red spots. Shapiro describes Battus philenor as "the signature riparian butterfly of our region, occurring along streams in foothill canyons and on the Central Valley floor, essentially everywhere where its only host plant, California pipevine or Dutchman's pipe, Aristolochia californica, occurs." 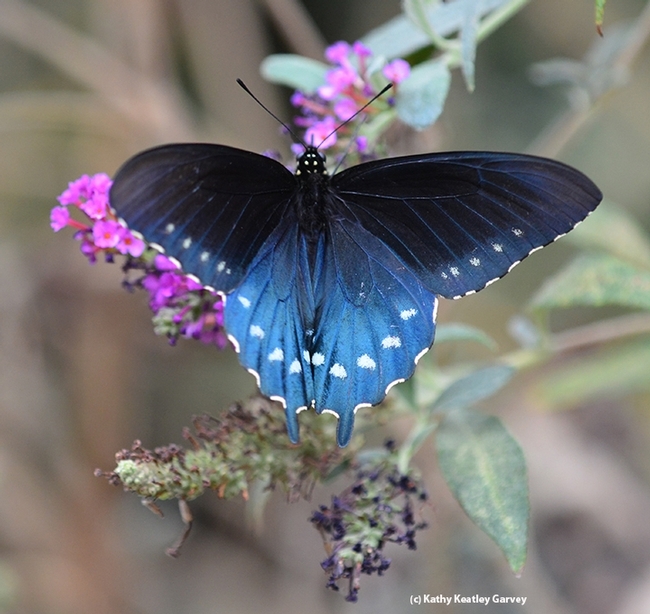 The butterfly, also nicknamed "blue swallowtail," is found throughout North America and Central America. "Adults are eager visitors to many flowers, including wild radish, California buckeye, blue dicks, Ithuriel's spear, and Yerba Santa," according to Shapiro. "In summer they regularly nectar at yellow starthisle when there are no native plants in bloom." "This species is warningly colored and inedible to vertebrate predators," Shapiro writes. "It derives its protection from the toxic aristolochic acids produced by the host, which it sequesters; females even pass these along to the eggs, which are also protected (and are brick red, laid in bunches of up to 20, and quite conspicuous). Eggs are laid only on young, tender, growing shoot tips and the larvae must begin by feeding on these. Initially they feed in groups. As they get larger they scatter and can tackle large, mature leaves. But because these react to feeding damage by becoming more toxic and unpalatable, a larva will feed on a single leaf only for a short time and then has to move on. Eventually most or all leaves end up damaged, but few are badly damaged. The larvae also feed eagerly on the immature fruits, which look like small bananas with fluted edges. 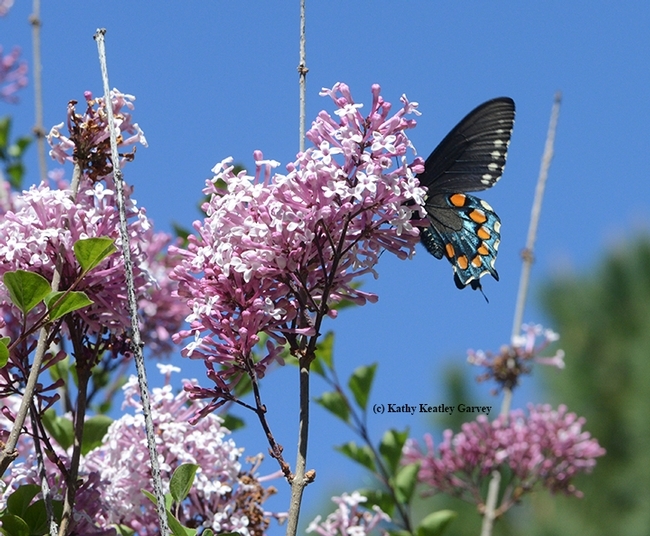 In big swallowtail years little if any seed ends up being set." The adults live about a month. So, let's enjoy them while we can! 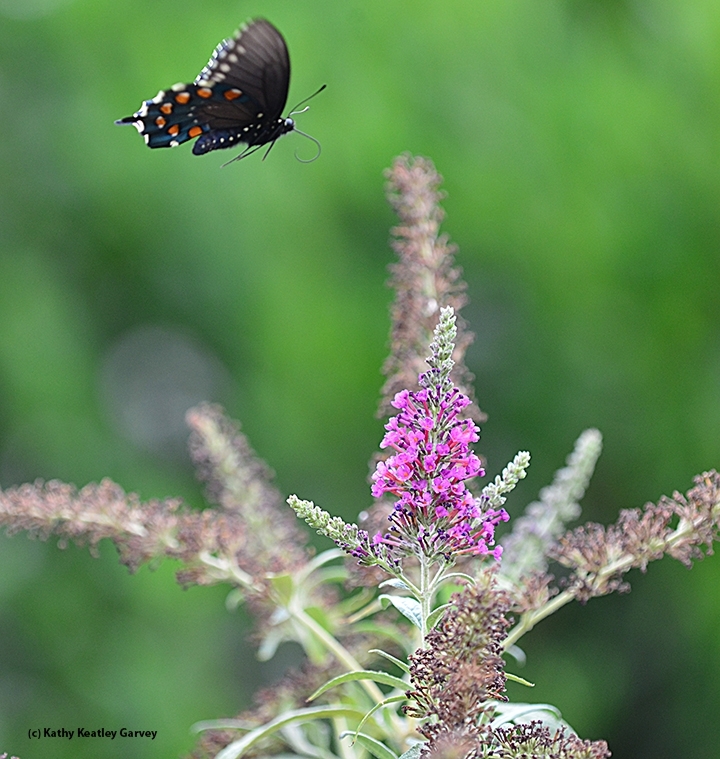 We followed this one around on our butterfly bush (Buddleja davidii) this afternoon as the sun dipped low in the sky. Usually, we see only the side view, but this one provided a dorsal view, flashing its colors. Blue. Brilliant blue. iridescent blue. Is any other blue so glorious? 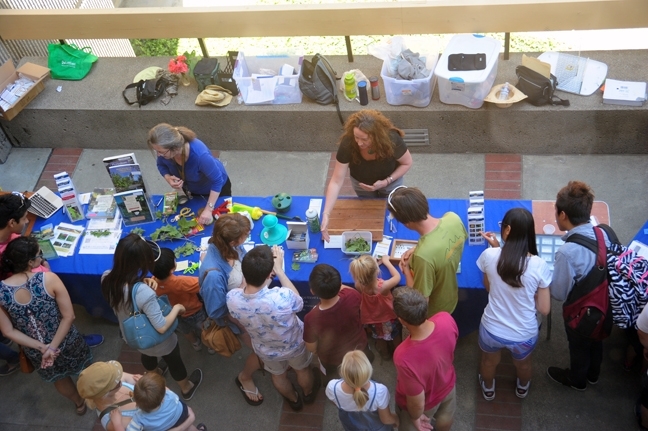 Visitors to the UC Statewide Integrated Pest Management Program (UC IPM) display in front of Briggs Hall at the 101st annual Picnic Day last Saturday at the University of California, Davis, got a close look at the Pipevine Swallowtail caterpillar. 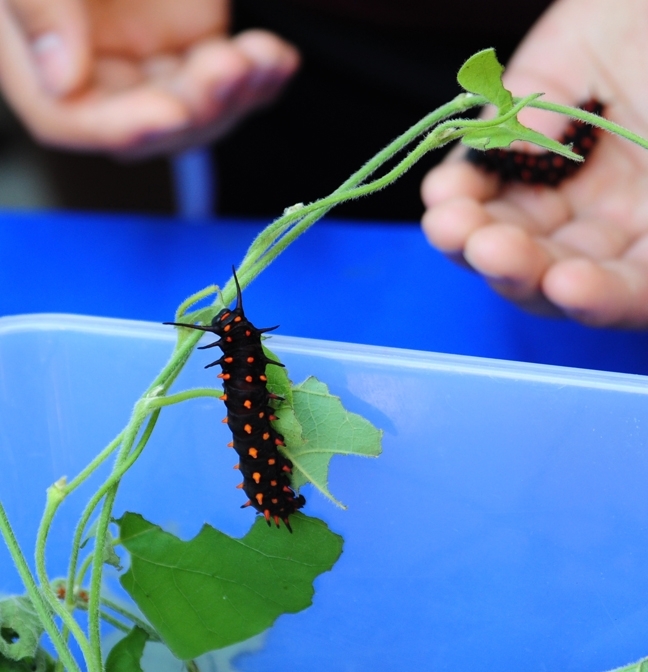 While the visitors watched or held them, the other caterpillars kept busy, munching on the leaves of their host plant, the pipevine. 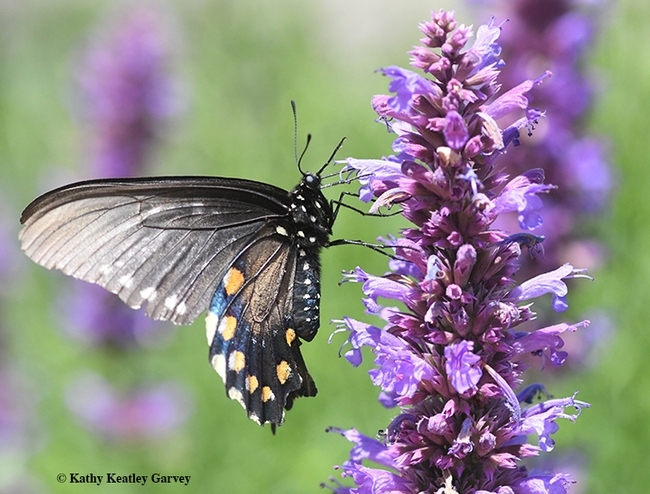 Butterfly expert Art Shapiro, distinguished professor in the UC Davis Department of Evolution and Ecology, has seen lots of Pipevine Swallowtails (Battus philenor) already this year. "There are plenty," he said today. "Don't eat 'em; they're quite poisonous." Both the caterpillar and the adult are poisonous. The caterpillars of the Pipevine Swallowtail feed on the poisonous host plant, Aristolochia, also known as the pipevine, Dutchman's pipe or birthwort. It contains the lethal toxin aristolochic acid. Nevertheless, the black caterpillars turn into beautiful adults. Found throughout North America and Central America, they are black with iridescent blue hind wings. Their wingspan can exceed three inches. "The Pipevine Swallowtail flies from late winter (February-March) to autumn (October, occasionally November) but is much more numerous before the 4th of July than later; typically it has two large flights followed by stragglers the rest of the season, often with a 'blip' upward in August," Shapiro writes on his website. "Usually the host plant stops growing in June, and thereafter there are no sites suitable for egg-laying--unless there is a local catastrophe (usually fire, though weed-whacking will do). Then the plants regenerate rapidly, producing new growth in the off-season, and any females around at the time quickly find and make use of the new shoots. Adults routinely live a month or so." "This species is warningly colored and inedible to vertebrate predators," Shapiro points out. "It derives its protection from the toxic aristolochic acids produced by the host, which it sequesters; females even pass these along to the eggs, which are also protected (and are brick red, laid in bunches of up to 20, and quite conspicuous)." 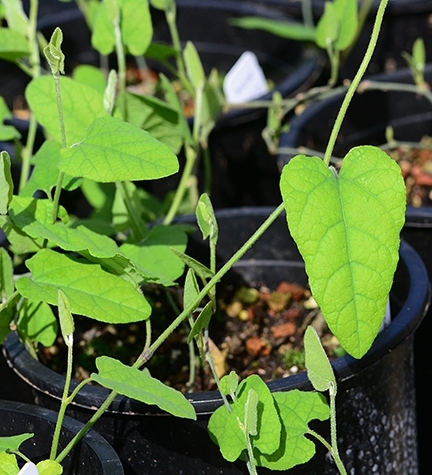 "Adults are eager visitors to many flowers, including Wild Radish, California Buckeye, Blue Dicks, Ithuriel's Spear, and Yerba Santa," Shapiro notes. "In summer they regularly nectar at Yellow Star Thistle when there are no native plants in bloom." We've seen many of the Pipevine Swallowtails fluttering around in the UC Davis Arboretum and gathering nectar from butterfly bushes. A word of warning from Shapiro: "Don't eat 'em; they're quite poisonous."